Gina McCarthy and Lisa Jackson spent roughly eight times more than Scott Pruitt has on international travel. Internal EPA documents provided to the Washington Free Beacon reveal Obama administration EPA administrators jet setting cost taxpayers roughly $1 million. The EPA has spent $124,000 for Pruitt and his security detail to travel to the G-7 summit in Italy and a trip to Morocco. McCarthy took 10 international trips in three years, including trips to Paris, Florence, Dubai, and Tokyo. Pruitt has come under scrutiny from the media for the travel costs, which include $84,000 for the G-7 summit in Italy last summer in airfare for Pruitt and security. The New York Daily News reported Pruitt is "burning through taxpayer money like an SUV guzzles gas, new documents show." A search for articles on McCarthy's international travel costs turned up zero results. "The double-standard couldn't be more clear: Under Barack Obama's EPA the media chose not to report on expenditures to protect the EPA administrator for international travel or the costs of their trips," said Jahan Wilcox, EPA spokesman. "But under the Trump administration the costs to protect our government officials is somehow scandalous," he said. Pruitt's trip to Morocco in December 2017 to promote U.S. liquefied natural gas exports cost $40,000, bringing Pruitt's international travel and security costs to $124,000. 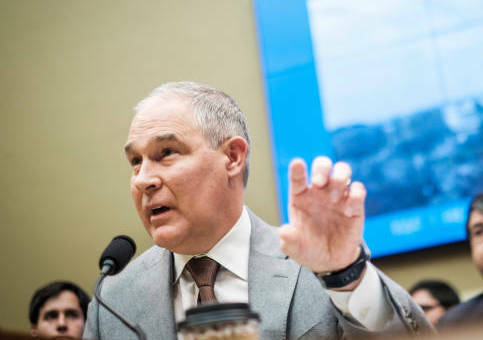 Pruitt has received an unprecedented amount of threats since becoming EPA administrator, which is costing taxpayers an extra $2 million per year, and prompted security officials to recommend Pruitt fly first class. McCarthy spent $629,743 on airfare and security for international trips between 2013 and 2016. Internal EPA documents show costs for trips to Ghana ($68,382), Peru ($45,140), Tokyo ($74,738), Paris ($41,321), Dubai ($90,368), Tokyo ($67,703), Florence ($56,193), Vancouver ($62,247), Vietnam ($68,268), and Beijing ($55,385). Jackson spent $332,113 on airfare and security detail for just four international trips. Between 2009 and 2012, Jackson spent $64,963 for trips to Tel Aviv; $59,950 to Rio de Janeiro; $51,436 to Montreal; and $155,764 to Beijing, Guangzhou, and Shanghai. In all, the Obama EPA administrators spent $961,856 on international travel, or 7.75 times more than Pruitt. This entry was posted in Issues and tagged EPA, Media Bias, Obama Administration, Scott Pruitt. Bookmark the permalink.